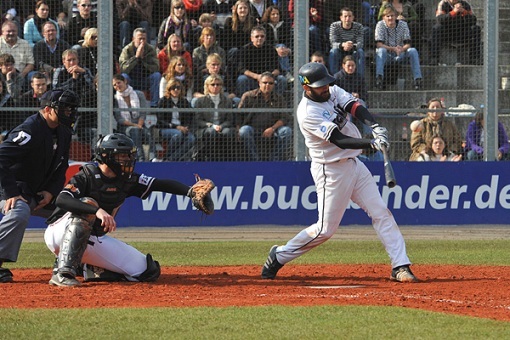 The BUCHBINDER LEGIONAERE finally have won the German Baseball-Bundesliga championship. They defeated the TORNADOS on Saturday afternoon 10-0 in seven innings to win the best-of-five series 3-2. It is the first title in team history and in the third try, as they lost the finals in 2006 and 2007. 1700 people in the stands pushed REGENSBURG forward from the start of the match. Philipp Howard delivered the early lead in the third with a two-run double. Daniel Husband’s RBI made it 3-0. They profited from a few errors by the MANNHEIM defense and added five more runs in the following. Markus Gienger ended the game due ten-run rule with a two-run double in the seventh. Alex Lauterbach scored three times. Besides a bases loaded situation in the first the TORNADOS never really had a chance. Philipp Hoffschild pitched another fine game and picked up the win with seven scoreless innings. He allowed four hits and two walks, while striking out six. They didn’t needed Philadelphia Phillies prospect Mike Bolsenbroek, who was available in the bullpen after finishing the Gulf Coast League season. Craig Pycock surprisingly started for MANNHEIM and pitched four innings in the loss. He gave up three runs (2 ER) on five hits. Paul Waterman and Helge Holfelder also appeared on the mound for the guest squad. Catcher Gienger received the Finals-MVP trophy for his overall performance. Hoffschild was awarded as best pitcher. Los Angeles Angels minor leaguer Ludwig Glaser was the best batter in the final series.